I had several incidents happen while working at Winyah Nursing Center and admittedly, some were borderline upsetting. I worked with a few people who had been employees there for about 20 years at the time. On one particular night, I turned to them three times for answers to the ghostly hauntings that were taking place around me. My two assistants, Anne and Geralene, called me to the Thompson/Myer room. “She’s upset and we’re hoping you can calm her down,” Anne explained of Mrs. Thompson as I came in. “How was she rude, Flo?” I asked, calling her by her name. “What did she look like?” I asked both ladies. “Michelle, can I see you out in the hall, please?” It was Anne, one of the 20 year employees. I stepped out into the hallway. Obviously, it was privacy Anne wanted. “What is it?” I asked as I closed the door behind me. Glenda had also been there working for about 20 years. She was the nurse on Station 1. Anne came along with me as curiosity got the best of her about who it was taking Mrs. Thompson‘s walker and going into the bathroom with it before vanishing. When we got to the desk we explained to Glenda what had happened. “I can’t put my finger on who it is,” Anne confessed again. “And she had the ball on top of her head, even when she went to bed,” Glenda added. I brushed off the new data and went back to my floor, Station 2. 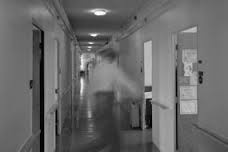 A couple of hours later, I was walking down the hall checking the residences when a patient’s call light came on about three doors away from me. “I’ll get it,” I called out to Anne and Geralene who were down the long hallway. I came into the room as Mrs. Lambert sat up in the bed. Mrs. Lambert was of sound mind. I can’t remember a time she was ever confused or disoriented. Her purpose for being in a nursing facility was because she was just old. She had no one who could stay at home with her to help with her daily routines. “No! I was wide awake,” she denied insistently. “Were one of the CNA’s coming to check your blood sugar?” I asked, knowing in my heart the aids knew better than to do something like that. I left and went back to 1st Station to ask Glenda if she knew who this person was. I had already figured it was a ghost. I explained the events that had occurred. Glenda thought and thought and then called the orderly, Robert, to the desk. Robert had been there a year or two longer than she had been. “She just tried to give Mrs. Lambert some insulin,” I said to Robert. “That’s what I’m saying, Robert,” I added laughing. I didn’t know how to respond to that, either. I could only offer reassurances as I left the room. On the way back to the desk, I stopped in the patient’s big bathroom. I had been employed with this facility a total of about 10 years and have used this particular bathroom so many times. That night would be the last time I would ever step foot in it again at least, alone. I only remember one other time in my life that I can recall, what I can only describe as being truly terrified of an entity. This night was the second time. From the moment I entered the bathroom until about three minutes later when I exited, I sensed something was wrong. I brushed it off as; the place is totally haunted. No big deal. As I used the facilities, I became increasingly frightened. I felt someone was in there with me and “he” was angry. A sense of real fear began rising inside of me as I suddenly took on a feeling that I would be “barricaded” inside the bathroom if I didn’t leave. I remember that term explicitly; barricaded. In just a few seconds of entering the room and my feeling of fear beginning, I had grown into a panic. As I reached for the nurses emergency call light I reasoned with myself; I’m alone in here. There’s no one here but me. God will protect me. Just calm down and take a deep breath. I kept repeating it to myself over and over again. The more I tried to calm myself, the angrier the entity became. He was completely pissed off as I sprinted toward the door to leave. I had the very distinct impression it would not open from the inside. I reached out and grabbed the handle and yanked. It opened. I stepped out from the bathroom and immediately, the feelings of anger, fear, and of being barricaded inside, dissipated. I have been scared before by ghosts but, as I said before, there was only one other time I was afraid to that degree.